CMS compiled the following resources and tools created by trustworthy organizations and directed to undocumented and immigrant families and communities, and advocates working with them. If you would like to suggest a resource, please send an e-mail at info@cmsny.org. Description: This online tool screens for DACA and non-DACA immigration benefits and relief. The tool also provides referrals to nonprofit legal services organizations. Description: An online immigration screening tool tailored for undocumented young people. The screening is free of charge, confidential and personalized. Description: The Pocket DACA app, available for both iOS and Android, provides information, resources, and tools to help individuals understand and apply for Deferred Action for Childhood Arrivals (DACA). Description: A national hotline to report raids, obtain legal assistance, and connect to local organizing groups. Description: Non-profit organizations and attorneys who provide pro bono legal services before the immigration court. Description: Searchable database of immigration attorneys, in private and non-profit organizations. Description: This video describes the steps that migrant families can take to prepare and plan in case of encounters with immigration enforcement. Description: Este video describe pasos que familias inmigrantes pueden seguir para prepararse en caso de encuentros con autoridades inmigratorias. 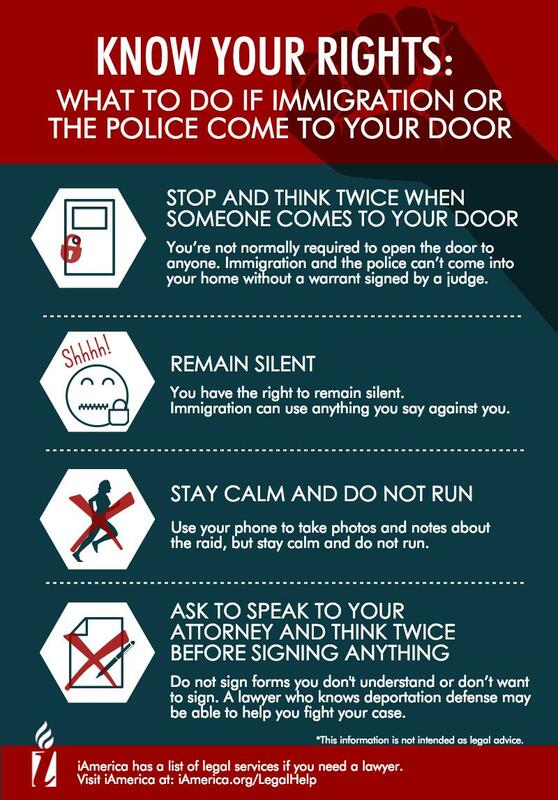 Description: This guide informs immigrants about encounters with law enforcement, how to read a warrant, and how to design an emergency plan. Description: Esta guía ofrece información sobre qué saber y hacer durante encuentros con autoridades, cómo leer una orden de cateo, y una lista de preparación en casos de emergencia. 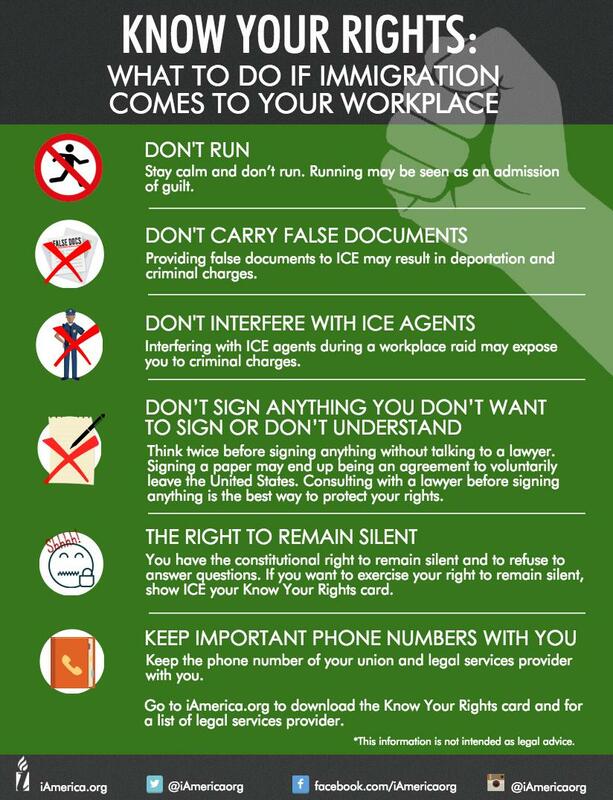 Description: This guide provides information about immigrant workers’ rights while on the job. Description: Esta guía ofrece información sobre los derechos de los trabajadores inmigrantes mientras están en el trabajo. Description: This guide, tailored for public school students and parents, provides information about students’ rights to public education and safety at school, parent and guardian rights, and how to report incidents of harassment and resources on filing complaints. Description: Esta guía, diseñada para estudiantes de escuelas públicas y padres, ofrece información sobre los derechos de estudiantes a una educación pública y seguridad en la escuela y los derechos de padres y guardianes. 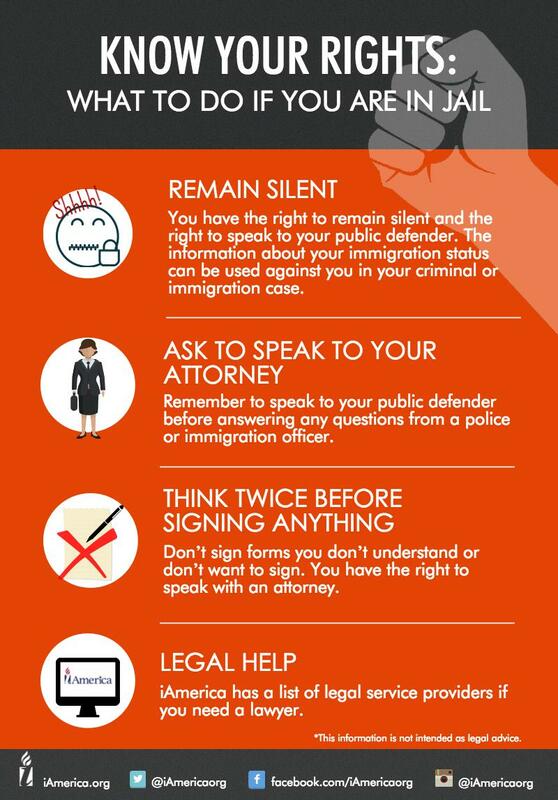 Description: This print-out card serves as a reminder for immigrants of their constitutional rights and can be presented to law enforcement officials. Description: A series of flyers that explain five ways immigrant families and communities can organize. Description: Este video muestra cinco pasos a seguir en caso de encuentros con autoridades inmigratorias. Description: This packet assists immigrant families in the preparation of a readiness plan, including childcare plan, obtaining immigration legal assistance, and informing them about their rights. Description: Una guía que ayuda a familias inmigrantes a preparar un plan de acción en caso de emergencias, que incluye un plan de cuidado para hijos, ayuda legal de confianza, y conocer sus derechos. Description: This bilingual guide provides practical tips for families encountering immigration enforcement including emergency planning. Description: This checklist outlines how a community can prepare in case of raids, including legal planning, services, organizing and media. Description: This toolkit contains critical information and analysis on the US detention and deportation system and guidance on how to prepare for ICE raids, including recommendations for immigrants and advocates on emergency preparedness and findings from research and experience. Description: 11″ x 17″ poster to hang in the home, reminding people of key rights and essential information to document. This poster is also available in Spanish. Description: This video describes the steps that immigrant families can take to prepare and plan in case of encounters with immigration enforcement. Description: Este video indica pasos a seguir para preparar a familias inmigrantes en caso de encuentros con inmigración. 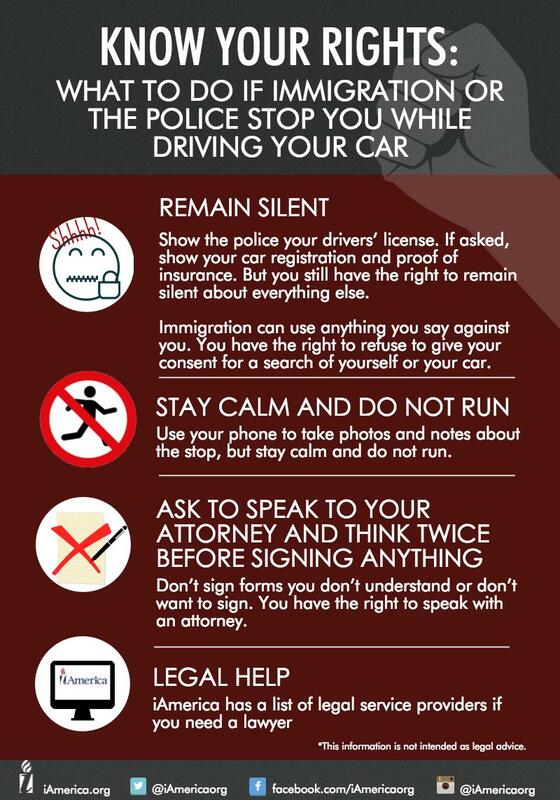 Description: This guide offers nine ways immigrants and their families can prepare for possible enforcement actions. Description: A guide that provides tools and resources to help protect and prepare youth and families in case of an Immigration and Customs Enforcement (ICE) raid. Description: A brochure that details ten ways educators and school administrators can support undocumented students. Description: This PowerPoint file contains a sample presentation to train immigrants on what they need to know and do when encountering immigration enforcement, police or the FBI in different settings and how to make an emergency plan for the family. Description: Esta archivo PowerPoint contiene un ejemplo de presentación donde inmigrantes aprenderán que necesitan saber y hacer al encontrarse con oficiales de inmigración o policía y cómo hacer un plan de emergencias para sus familias. Description: Videos of presentations by legal service providers and experts that explain immigrants their rights and safety planning. Description: This information sheet offers guidance to potential and current beneficiaries of the Deferred Action for Childhood Arrivals (DACA) program. This guide is also available in Spanish. Description: This document explains the DHS memorandum signed by Secretary Kelly, “Implementing the President’s Border Security and Immigration Enforcement Improvements Policies” on February 20, 2017. Description: This document explains the DHS memorandum signed by Secretary Kelly, “Enforcement of the Immigration Laws to Serve the National Interest” on February 20, 2017. Description: This annotated document provides analyses, relevant facts and links to useful resources to the executive order on enhancing public safety in the interior of the United States signed by the Trump administration on January 25, 2017. Description: This annotated document provides analyses, relevant facts and links to useful resources to the executive order on border security and immigration enforcement signed by the Trump administration on January 25, 2017. Description: This toolkit outlines a plan for faith communities to stand in solidarity through rapid response mobilization to stop immigration raids, deportations and support impacted communities. Description: This toolkit provides background information on sanctuary, a step-by-step guide to sanctuary, laying the groundwork to serve as sanctuary, legal questions, communications, social media, and advocacy strategies. Description: This toolkit is designed to help policymakers, at the local level, who seek to create sanctuary style laws and policies. The policy guidance in this toolkit is directly informed by the important lessons of cities and counties who have lead these efforts to date. Description: This document provides answers to frequently asked questions about immigration enforcement actions in sensitive locations. Description: A CMSOnAir podcast episode features an interview with Linda Rabben, Associate Research Professor at the University of Maryland, on the refuge and protection of migrants and refugees – also known as ‘sanctuary.’ Professor Rabben traces sanctuary back to its faith traditions and examines its central role in past and present movements that sought to welcome, support, shelter, and advocate for vulnerable populations. Description: CMS conducted a study on the multi-faceted work of non-governmental and community-based organizations (NGOs and CBOs) and their public and private partners to implement the Deferred Action for Childhood Arrivals (DACA) program and to build capacity to serve immigrants. Description: This paper provides a statistical portrait of the US undocumented population, with an emphasis on the social and economic condition of mixed-status households – that is, households that contain a US citizen and an undocumented resident. The study finds that mass deportations would plunge millions of US families into poverty, cost $118 billion to care for US-citizen children of deported parents, imperil the housing market and reduce GDP. Description: CMS reports that the total undocumented population in the United States has declined gradually over the past few years. Description: This report reviews the latest information available about the growth of the foreign-born population and provides information about recently arrived temporary residents in the population. Foreign-born population growth, legal and undocumented, as well as new arrivals, have remained fairly stable over the past few years. Description: This report examines information debunking the alleged surge of immigration in 2014 and 2015. Resource: The Estimated Undocumented Population is 11 Million. How Do We Know? Description: This report describes the origin of the widely reported estimate of 11 million and shows why claims of much higher numbers are not credible. Description: This report reexamines the Current Population Survey (CPS) data used in a report by the Center for Immigration Studies (CIS), along with DHS data on border apprehensions, to answer whether the reported increase in the foreign-born population in 2014-2015 could be the result of routine random fluctuations in the data collected in the relatively small CPS. Description: In this article, authors Robert Warren and John Robert Warren describe a method for producing annual estimates of the unauthorized immigrant population in the United Sates and components of population change, for each state and DC, for 1990–2010. The authors quantify a sharp drop in the number of unauthorized immigrants arriving since 2000, and they demonstrate the role of departures from the population (emigration, adjustment to legal status, removal by the Department of Homeland Security [DHS], and deaths) in reducing population growth from one million in 2000 to population losses in 2008 and 2009. Description: This paper offers a statistical portrait of the intended direct beneficiaries of the Deferred Action for Parents of Americans and Lawful Permanent Residents (DAPA), the Deferred Action for Childhood Arrivals (DACA), and the DACA expansion (DACA-plus) programs. It finds that potential DAPA, DACA, and DACA-plus recipients are deeply embedded in US society, with high employment rates, extensive US family ties, long tenure, and substantial rates of English-language proficiency. Description: This paper shows that the belief that undocumented immigration is upward-trending is mistaken and that, in fact, the undocumented population has been decreasing for more than a half a decade. Description: This paper documents dramatic changes in unauthorized immigration to the United States in the past two decades. It presents estimates of the unauthorized resident population derived from American Community Survey data, supplemented by recent estimates produced by Warren and Warren (2013), and statistics from IPUMS-USA. The paper highlights several trends that emerge from this data, including the precipitous decline in arrivals into this population since 2000 (particularly from Mexico), the rapidly increasing average length of residence of unauthorized residents, and the growing salience of visa overstays in constituting this population. The paper provides estimates of those who would be eligible for the Deferred Action for Parental Accountability (DAPA) and Deferred Action for Childhood Arrivals (DACA) programs. Description: CMS developed a series of statistical procedures to derive estimates based on microdata collected by the US Census Bureau in the 2010 American Community Survey (ACS). The estimates provide detailed demographic information for unauthorized residents in population units as small as 100,000 persons. Description: Cecilia Muñoz, Assistant to President Barack Obama and Director of the White House’s Domestic Policy Council, joins CMSOnAir to reflect on the Administration’s efforts on immigration during the past eight years. In this episode, Ms. Muñoz speaks with CMS’s Executive Director Donald Kerwin on the implementation of the Deferred Action for Childhood Arrivals (DACA) program, Syrian refugee resettlement in the United States, and the government’s response to the surge of Central American unaccompanied minors and families into the country. Description: This paper speaks to another reason to question the necessity and value of a 2,000-mile wall along the US-Mexico border: It does not reflect the reality of how the large majority of persons now become undocumented. The paper presents information about the mode of arrival of the undocumented population that resided in the United States in 2014. Description: This paper identifies potential common ground in the US immigration debate, including the national interests that underlie US immigration and refugee policies, and broad public support for a legal and orderly immigration system that serves compelling national interests. It focuses on the cornerstone of immigration reform, the legal immigration system, and addresses the widespread belief that broad reform will incentivize illegal migration and ultimately lead to another large undocumented population. Description: Executive order signed by President Trump on January 25, 2017 that directs DHS to begin construction of the wall on the US-Mexico border, build or operate detention facilities near the southern border, end the catch-and-release policy, and hire another 5,000 border patrol officers. Description: Executive order signed by President Trump on January 25, 2017 that directs the Attorney General and Secretary of Homeland Security to designate sanctuary jurisdictions and make them ineligible for federal grants, except as needed for law enforcement purposes. The order also empowers law enforcement agencies to pursue removal of all undocumented immigrants (without exception), non-citizens who are a security risk, and individuals with final orders of removal. It restores 287(g) program. It calls for a list of sanctuary jurisdictions and a weekly list of crimes committed by unauthorized immigrants that would be made publicly available and calls for the hiring of additional 10,000 ICE personnel. Description: Executive Order signed by President Trump on January 27, 2017 that limits the refugee admissions and bans travel from seven Muslim-majority countries. Description: Executive Order signed by President Trump on March 6, 2017, to limit the refugee admissions for at least 120 days, to place a travel ban on people from six-Muslim majority countries, and to clarify that legal permanent residents and current visa holders are exempt from the ban. Description: Executive Order signed by President Trump on April 18, 2017, to call on the Departments of Homeland Security, Justice, Labor, and State to suggest reforms for the H-1B visa program to ensure they are awarded to the most-skilled and highest-paid petition beneficiaries. Description: This document is designed to answer some frequently asked questions about how the Department will operationally implement the guidance provided by the president’s order.